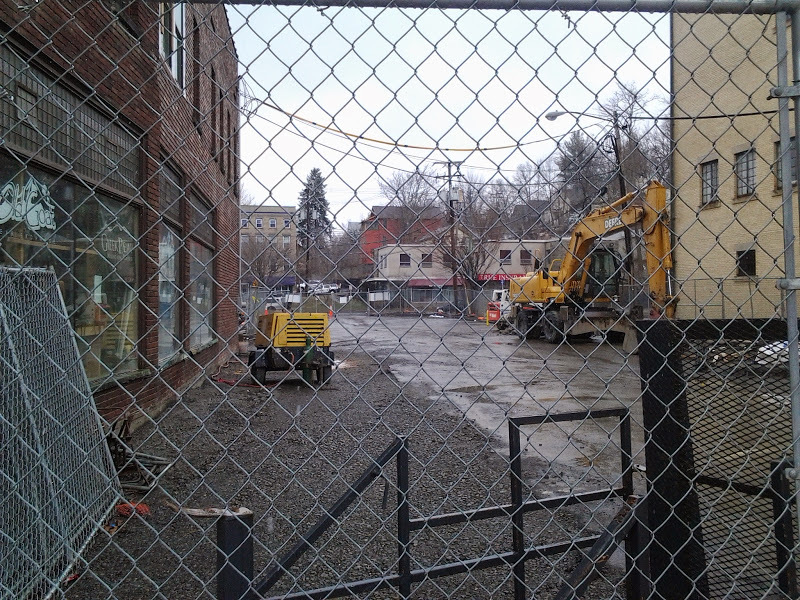 Readers living or working in downtown might have noticed the lack of progress on the Carey Building, where a five-story addition is underway on top of the two existing floors. A look at the site shows that the underpinning (foundation-strengthening) process has been completed and covered up, but work doesn’t appear to have moved much farther than that. Well, there’s a reason for that. 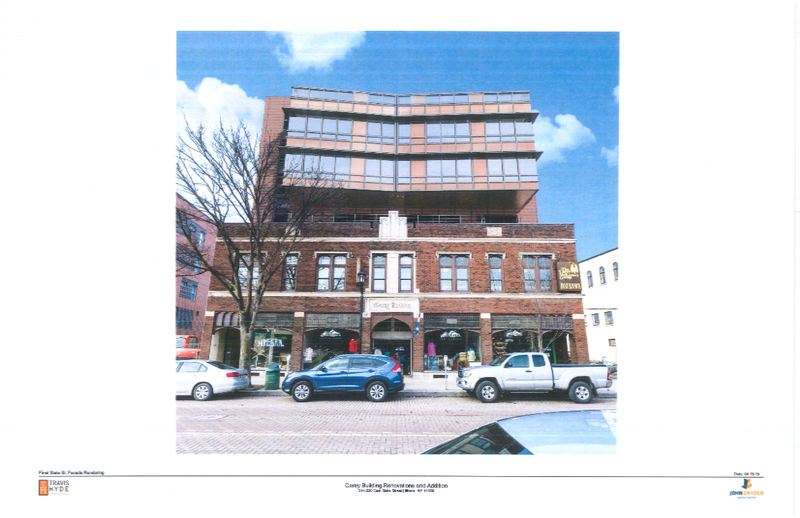 The building plans can’t move forward as approved. 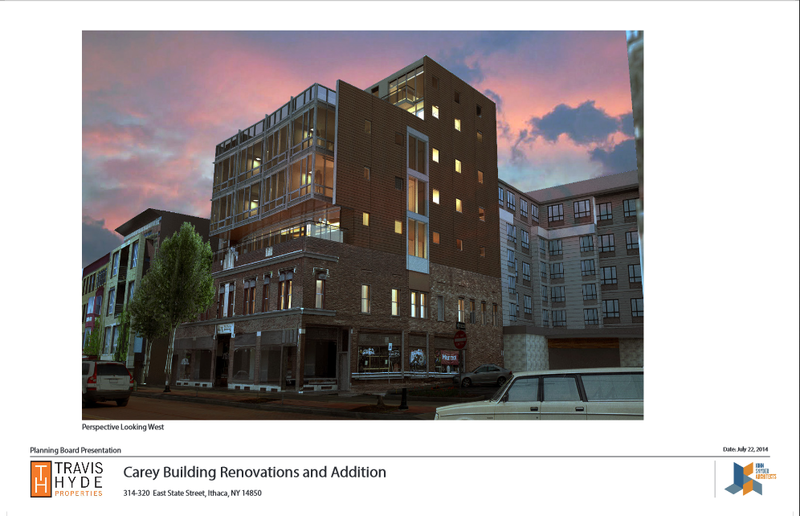 The currently approved design calls for interstitial space between the second and third floors. Interstitial space is an intermediate space between floors sometimes used for housing mechanical equipment. These type of designs, while expensive, are often employed in multi-floor lab or hospital space, where remodeling or re-purposing of floor space is common. 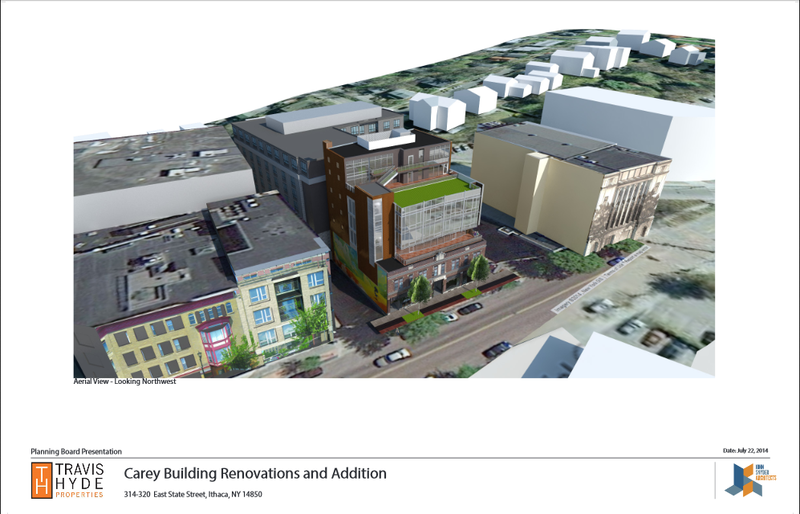 The existing second and new third floors of the Carey Building are used/will be used for business incubator space, where that type of flexibility is a huge asset. Unfortunately, it also doesn’t comply with code, which no one realized until recently. 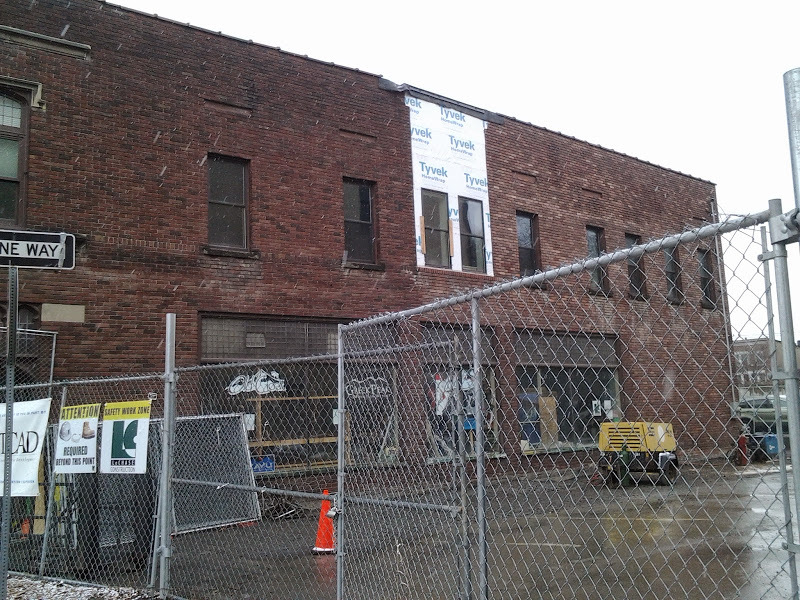 The new plan is to put in what’s called a plenum space between the third and fourth floors. A plenum space is between the structural floor and a dropped ceiling or raised floor, and it’s used to house HVAC, communication cables, or other mechanical equipment. The change in layout will result in an increase in building height from 77 feet 10 inches to 83 feet. 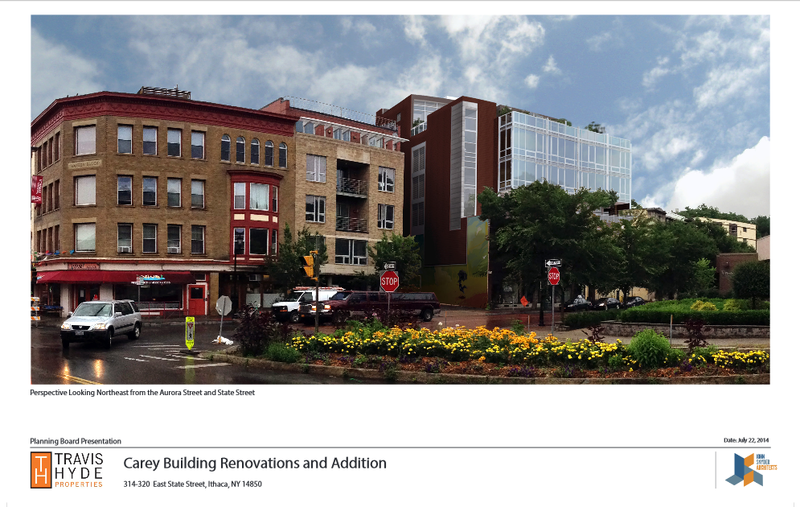 A few other modifications are also planned – a glass railing on the third floor will be changed to metal, and juliet balconies are being removed from the northern facade (back side, facing the new hotel) because the removal of an old chimney during the foundation-strengthening forces the need for an area variance that the developer doesn’t want to pursue. The old chimney encroached on the rear setback, but with it gone, that grandfathered privilege went with it. The top floor southern balcony (front side) may also be removed as a cost-cutting measure down the line. An emergency stairway for the sixth and seventh floor has been moved from the exterior to the interior. 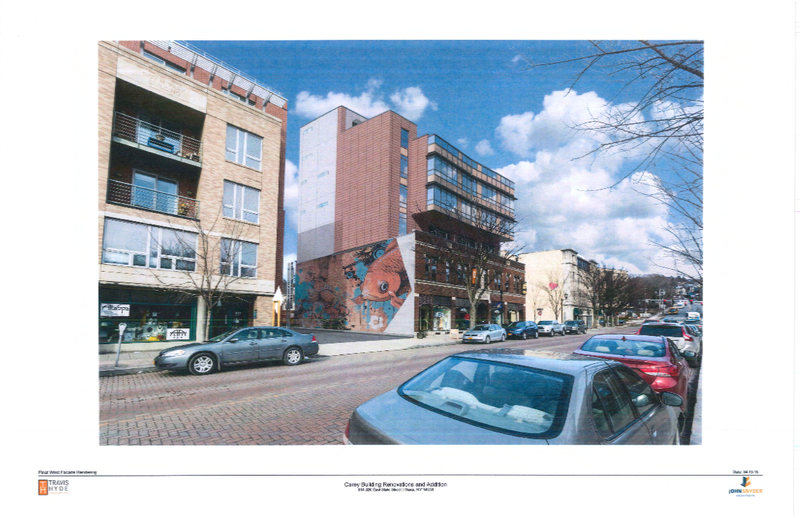 These changes have to be approved by the Planning and Development Board, as well as the Board of Zoning Appeals. The Planning Board is set to review and make its decision later this month; the BZA, probably early May. 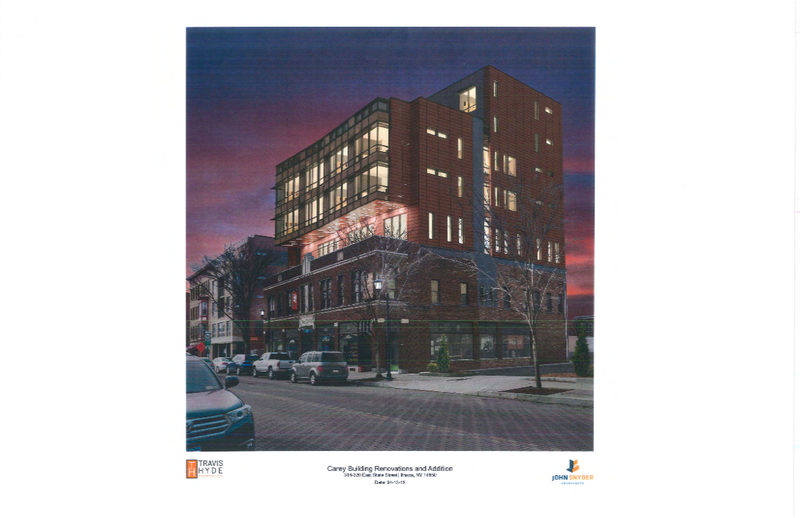 The Carey Building addition will add a third floor and 4,200 sq ft to the Rev business incubator (nearly doubling it to 8,700 sq ft), and on floors 4-7, there will be 20 apartments. Floors 4 and 5 will have 16 studio apartment units that average only 400-500 sq ft, their small size enabling them to be rented at a lower price. The 4 units on floors 6 and 7 will be larger 2-bedroom units. The $4.1 million project is being developed by local firm Travis Hyde Properties and built by LeChase Construction. This architect is making a great showing. First Purity and now this blunder. Not a great way to start out. That sounds good on the surface, but if you have been involved in a hospital renovation, more likely than not, you will have found the interstitial space is a decades-old, multi-layer, convoluted mess of piping, wiring, ductwork, HVAC and electrical equipment that wasn’t properly managed over time. But, at least those projects got off to a good start! Major facepalm all around. I hope these developers don’t drop any other building features in order to recover from preventable mistakes. On the bright side, I like the window pattern on the east side much more now. Wasn’t the vertical construction on this building “imminent?” What happened to all of the materials – namely steel – that had been fabricated for this project? I’m still somewhat dumbfounded that something like this could happen at this late stage of the project.